The Water Warriors' Piranha is the 2004 remake of the Water Warriors' Lightning of the Water Warriors line. As such, the Piranha features 'Hydro Power', the Water Warriors' equivalent to the Super Soaker CPS pressure system. Since it is basically a body-shape change, the performance and behaviour of the Piranha is almost equivalent to that of the Water Warriors Lightning. The Piranha features 3 different nozzle settings ranging from a small nozzle with a diameter of about 1mm to its largest nozzle with a diameter of around 2mm. Streams produced from the largest nozzle have a good feel while the smallest nozzle offers the best level of conservation for this blaster. Shot times range from roughly 5 to 14 seconds without needing to repump depending on the nozzle selected. The pressure chamber provides good power to the nozzles. 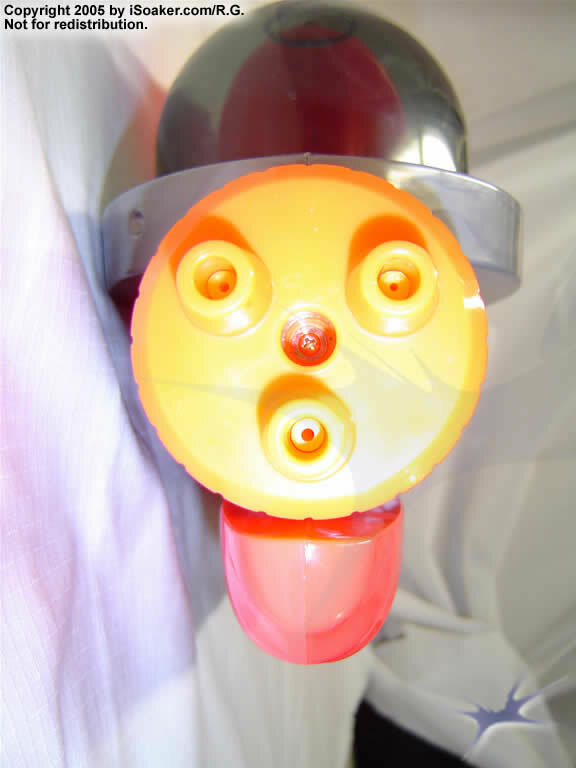 The single firing chamber displays a near CPS-like quality (it is called 'Hydro Power' by Buzz Bee Toys); streams have only minor drop off near to the end of the water level in the pressure chambers. One nice feature on the Piranha is that the pressure chamber is housed inside a tinted, but transparent shell. Thus, while pumping, one can watch the internal rubber diaphragm expand. With this feature, one can easily determine how much more pumping is required without needing to look at the pressure gauge. An interesting feature on the Piranha is its electronic pressure gauge. Activated by a trigger-switch mounted opposite to the nozzle trigger, the pressure gauge indicated whether the firing chamber is full pressurized by glowing different colour patterns. When all the lights glow green, the pressure chamber is at maximum (though it is still recommendable to continue to pump until one can hear the check-valve functioning and the pump has more resistance in order to truly fill the firing chambers). As well, the placement of the pressure gauge activator means one will almost always activate the pressure gauge when firing, potentially wasting battery power unnecessarily. Also, this trigger switch rubs the user's hand between the thumb and index finger, potentially leading to hand strain after prolonged use. 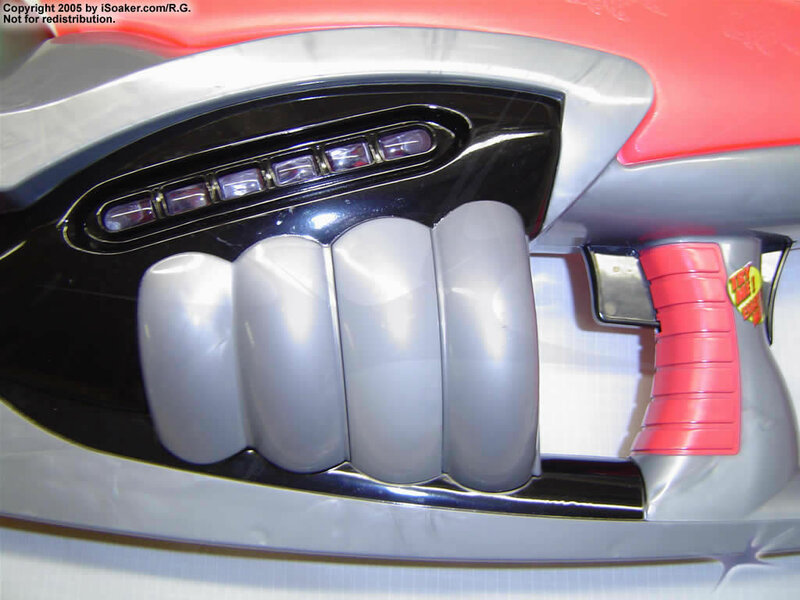 The trigger/grip area is a little short due to the blaster's design. As such, it is a little small for those with larger hands (typically leaving no room for one's pinky finger). The Piranha features a forward-mounted, non-guided pump. Pumping is smooth and easy, but the pump volume is not too large, thus many pumps are required to fully pressurize the pressure chamber. The reservoir on the Piranha allows for 2 additional full charges of the firing chamber before emptying. The intake area of the reservoir is near to the rear of the blaster, thus when water level is lower, it is adviseable to tilt the blaster slightly upwards so that the pump can draw in water. While the Piranha does make use of all it holds, the fact that the reservoir is opaque makes it harder to determine how much water is remaining within. All in all , the Water Warriors Piranha makes a good addition to anyone's armoury. When using, one should still be wary of others using CPS-based soakers. However, the Piranha user can keep pace with almost anything on the modern water war field. 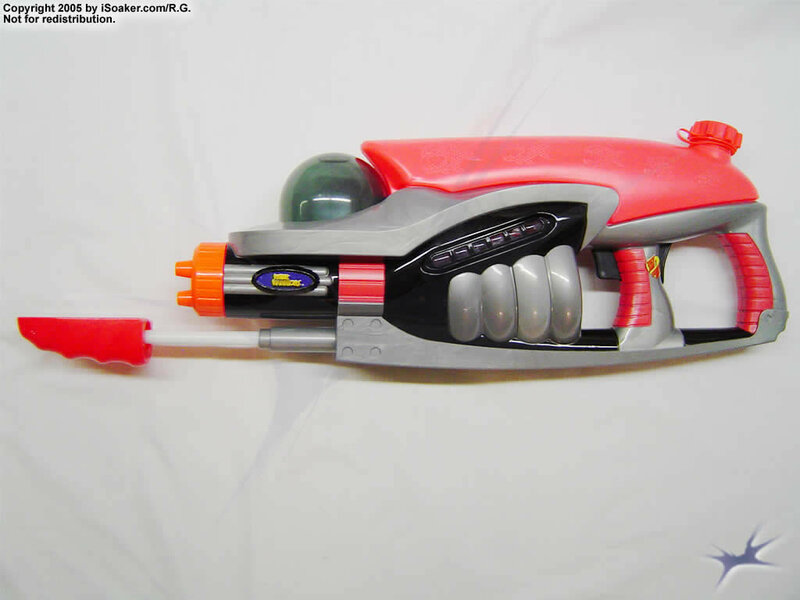 In 2005, a newer model of the Water Warriors Piranha was released that features a revised, more distinct selection of nozzles. Click to go to the original Piranha (2005) review. Easy to pump, pressurize, and blast away. CPS-like pressure chamber gives good power. Clear casing on the pressure chamber a nice touch. Multiple nozzles allow the user to drench more or conserve depending on how much water remains. No strap. Reservoir opaque and size a little small for a blaster of its size. Hand grip area around the trigger small for those with larger hands. External reservoir cap tether more prone to damage than an internal string-anchor one. Forward mounted pump more likely to be damaged if left extended. I stepped off my back porch and looked around at the yard. The sun was coming through the oaks from a just-about-vertical angle, and throwing a funky patchwork of yellow and shadow onto the grass. As I watched, the wind brushed at the branches high above my head, and the patchwork shifted, in synch with a chorus of rustles from the millions of leaves overhead. About eighty five degrees out, very little wind at ground level, the perfect day to do a somewhat official test on my Pirahna/Lightning. Not that I haven't used the Pirahna before. It's served me faithfully through at least one war and probably a dozen skirmishes. I just haven't drawn up a review of it in quite a while. Heck, haven't even HELD it in quite a while. I looked down at the gun in my hands. Vaguely oval shaped, the rounded points at each end cut off, one a semi-stock, the other the nozzle selector. The broad pink tank curved over the top of the gun, flairing slightly as it approached the smoked gray pressure chamber cover, black rubber PC visible inside. Huh. Don't remember those fish on the sides. Like all water guns made within the last decade and a half, the nozzles selection was a vivid orange, though tinged with pink. The pump handle was pink, as was the trigger, a funny offset to the gray and black colorway. The gun creaked in my hand as I walked over and turned the hose faucet on, and I unscrewed the cap as I walked over to the business end of the hose. The Piranha felt a little flimsy in my hands, like the light plastic it was, the seams slightly offset to each other. Feelings were deceiving though. I managed to thoroughly soak my shoes and bottom foot of my jeans as I filled the gun, somehow got a spray of water all over my black skull shirt. I brought the gun up to my shoulder, and was surprised at how awkward it felt. It was all crunched up, my arms sticking out strangely to the sides as I supported the short bullpup-styled rifle. I brought it back down, looked at it. I didn't remember it being this short or difficult to manage. The trigger cutout was a hair too small for my four fingers to curl around the grip, my pinky either crunched up or laid along the lower side of the frame. Hm. I brought it up to my shoulder again, and this time it felt more natural. Muscle memory reasserting itself apparently, from another time in my life, when I did this just about every day, three months out of the year. My left hand, on the pump, wobbled a bit due to the lack of tracking, and I moved it a few inches back to the slightly flairing gray plastic of the bottom frame. Much more stable. I squeezed off a quick shot. A thin, needle-like beam jetted out, arcing down to land about thirty feet away, the sound of water leaving the nozzle almost like static as spray seperated from the shot. I checked the nozzle. Ok, that was the smallest. I hadn't thought to check the sizes beforehand. A quick twist of the selector brought up the next largest nozzle on the menu. Barely larger, but much more cohesive, it didn't have a tail of spray like the other did. Same distance. The final nozzle, the biggest available, was, like the one before it, just a hair bigger than the previous. It had pretty much the same distance. I twisted again, brought the smallest back into play, and fired a burst. Quit a bit smaller than the biggest. Funny how there was no dramatic change in size as I advanced the selector, yet the smallest and biggest were definitely seperate in the size. Rotation of the gun was difficult due to its short stature - it was uncomfortable to shift it around at shoulder level, and I discovered it to be much easier to turn at the waist and keep it held straight out, my eyes lined up on what serves for sights, the seam of the tank. I turned and shot a tree, the small beam hissing through the air and impacting the bark with what appeared to be a small but businesslike slap. It made a sizzling noise as I held the trigger down, water running over the rough surface as it headed for the ground. The medium nozzle amped the slap up a bit, with an moderately sized splatter as well. The biggest darkened a much larger patch of bark and blew mist off the tree. I'm still as sure of this gun as I was back in '04. It's short, has decent range for a stock soaker, shoots for a long time, has reasonably sized nozzles, and if you fill, pump and fill again, you've got some staying power. It's not too heavy, not too light, durable...just about the perfect water weapon. And it's cheap too, which is a definite bonus. It is a worthwhile addition to any armory. It felt great to have a new CPS in my hands again. I've missed those guns. The range is excellent though I estimate it falls a little short of the advertised 40 feet. I eyeballed it at about 35 feet, which is great in this day of underpowered blasters. I really liked the trigger pull. Nice and smooth, no hang-ups, no clicks. The water seems to flow out of the gun, not explode like some of my other soakers. Not only does this feel really cool, but it might give you a 1/10 of a second drop on someone, if you're targetting them from a position of concealment and don't want them ducking cause they heard your gun fire. I also really like the shape. The thumbhole stock and the compact design give it a more militaristic feel, something which is definitely lacking these days. And while I don't usually get excited about the pump on a soaker, I like this one a lot. It feels smooth, and it quickly fills the p/c. The nozzle selection is really poor in my opinion. I'd recommend using the largest nozzle as next year's smallest, and advancing in size from there. The 2 smallest don't have the necessary soaking power for a gun this good. The tank should be a little flatter, without such a curve to it. The curve in the top prevents me from filling the tank to its limit, which I don't like, though it's not a big problem. I really, really don't like the lights in the gun. Electronics and waterguns don't mix, IMHO, and one of the first things I do to any electronic guns is to pull the batteries out. The pressure gauge trigger is kind of uncomfortable as well, and it turns on whenever I fire. Next year I'd like to see a non-electric version of this gun. That'd rock! As much as I like the shape and feel of this gun, I can't stand the pink tank and pump handle. I know it's supposed to be red (it probably is technically "red"), but it's such a pale shade of red that it looks pink to me. This is the first gun I ever thought about painting. Also, the fish on the side have to go, IMO. This is a serious gun, and the fish...aren't. The shape reminds me of an FN P90, a rather futuristic-looking submachine gun that's currently in use by (I think) the UN and several European nations. However, the handling automatically (pun intended) reminds of the Heckler & Koch MP5, which is good, as the MP5 is the most used (and best all around) submachine gun in the world. Hopefully the Pirahna will achieve a similar level of success. This is an excellent compact rifle. While I'd like to see it a little more compact, the size and handling are just right. It's got punch, staying power, and range, all of which are necessities for a good gun. I look forward to testing this gun in battle, and I'm definitely going to recommend it to my friends. Two thumbs up!